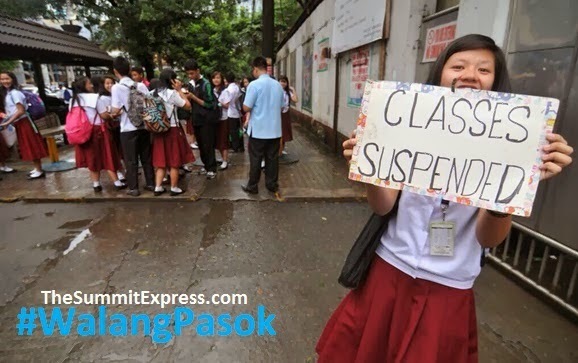 Manila, Philippines - Some local government units (LGUs) and schools announce class suspensions for tomorrow, July 17, 2014 (Thursday) due to the effects of Typhoon 'Glenda'. The advisories were released through social media early Wednesday, July 16. At 4:00 PM today, PAGASA advised that the eye of Typhoon "Glenda" was located at 160 km West of Olongapo. By tomorrow morning, it will be at 450 km West of Laoag City, Ilocos Norte or outside the Philippine Area of Responsibility (PAR).